In February 1978, as a first-year Architecture student at Manchester University, Ashley Hanson saw an exhibition at the Whitworth Art Gallery, ‘Peter Lanyon: Paintings, drawings and constructions, 1937-64’, sensing the power of painting for the first time and the artists’ very personal and unique interpretation of the world. The exhibition proved to be life-changing: Ashley decided to be a painter, studying Fine Art at Canterbury College of Art, 1980-83. The early 80’s were a time of turbulence in the art world, figurative painting was making a comeback, undermining the orthodoxy of abstraction. Baselitz, Keifer, Schnabel, Sandro Chia, Paladino, the ‘new Glasgow Boys’ were all coming to prominence. At Canterbury, Ashley was exposed to quality teaching on both sides of the abstract/figurative divide. 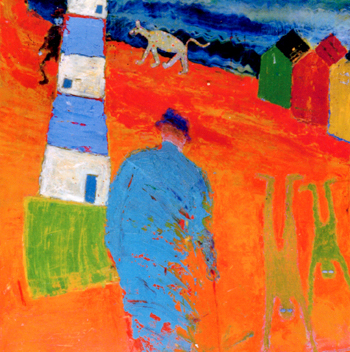 Introduced to the world of colour and abstraction - Matisse, Bonnard and the artists of the St.Ives School - through the teaching of Stass Paraskos and the visits of Geoff Rigden, Mali Morris, Patrick Heron and Terry Frost, his work was also influenced by the figurative stance taken by Dennis Creffield, Eileen Cooper, and Peter Griffin. Perhaps the greatest influence was Thomas Watt, mesmerising the students with his plein-air paintings on the weekly visits to the coast. From all this emerged Ashley’s distinctive autobiographical paintings: image in an intensely coloured flattened space. From this early stage, his favoured subject was the coast: the breakthrough painting ‘The Lighthouse’, contains references to Blackpool and Whitstable, seaside postcard humour and drunken excesses in the bar. The upside down figures a direct reference to the view from Blackpool’s high sea-wall at the height of summer. Many of Ashley’s trademark techniques of poring, skimming, layering and brutal editing were discovered in the Print Room at Canterbury, alongside the idea of working in series, allowing all possibilities to be explored.